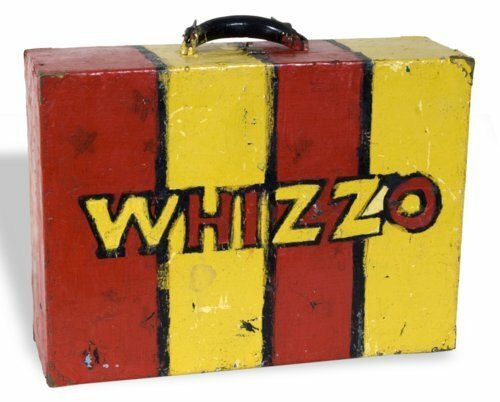 Yellow and red television prop suitcase used by Whizzo the Clown. Whizzo was a character created by Frank Wiziarde, a children's entertainer in Kansas City, Kansas. He was best known for his children's television show that aired on local stations in Kansas City and Topeka from 1954 to 1987. Wiziarde was born in Westmoreland, Kansas in 1916 and soon joined his family's traveling circus act. In the late 1940s Wiziarde transitioned to broadcasting, but merged the two professions to entertain children. Known for his use of props, Wiziarde most likely fashioned this suitcase himself and used it on the show to house various tricks.